Is Egg Boy is a hero or a villain? How do you help your kids deal with disappointment? What will your child thank you for later in life? Is Egg Boy a hero or a villain? This week a young man by the name of Will Connolly decided to show Independent Senator Fraser Anning what he really thought of him. Anning has drawn global condemnation after suggesting that the Christchurch massacres were a result of Muslim immigration. While Anning was speaking to the media, Will stepped up and slapped an egg on his head. Do you see Will Connolly as a young hero, standing up for minorities against political hate speech? Or is he a brat seeking social media fame? Does he need his phone to be confiscated by his obviously lax parents? When is it time for children to be independent? This week a Sydney mum put her nine-year-old son on a flight alone, as an unaccompanied minor. She then got very mad at Virgin personnel after finding out he spent the night in a storage room when his flight was diverted to Melbourne. The boy was travelling to Brisbane to visit his grandparents. Would you send your nine-year-old on a flight alone? If not, what age would you be comfortable sending them? What different activities do you allow your child to do independently? How does it work? This weekend Shevonne’s family went to an equine farm stay. Her daughter Darcy had been looking forward to it for weeks because she was going to have a horse riding lesson. Anyone who lives in NSW will know that it rained all weekend. 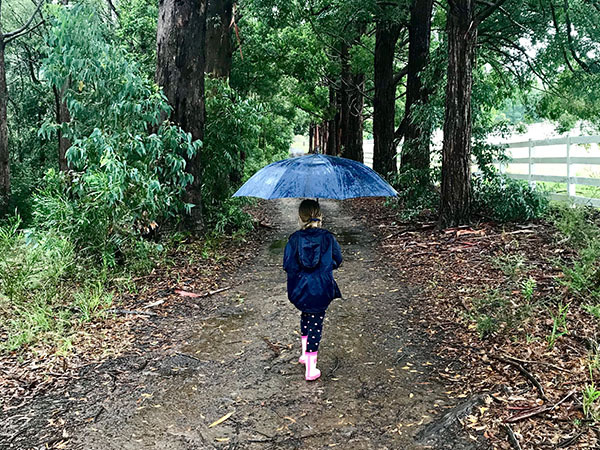 Darcy was really disappointed, and Shevonne spent the weekend explaining why she can’t control the weather, and why it’s unsafe (and unkind) to take horses out in the rain. In the end, the family drove 30 minutes to a crazy lolly shop, plus Shevonne promised they would come back when the weather was better. How do you deal with your child’s disappointment? Do you just let them deal with it (therefore building strength and resilience) or do you cave in like Shevonne did, and offer alternatives and promises to make them happy again? One disappointed little girl walking in the rain. This week writer Suzi Catchpole wrote a list of 15 things your children will thank you for later in life. There are lots of things we do as parents that our kids don’t recognise now. What do you do now that is a chore (or not) that you think your children with thank you for later in life?